Texas police officer that pulled gun on teenagers outside a local pool resigns. McKinney police officer Eric Casebolt resigns after cell phone footage released. 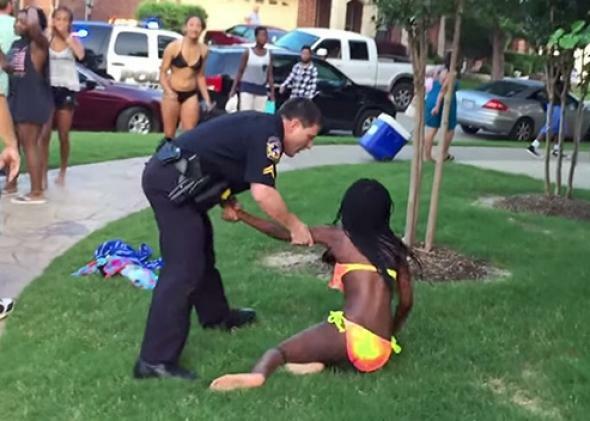 The Texas police officer who was caught on camera pulling his gun on a group of teenagers and pushing a teenage girl to the ground outside a neighborhood pool in McKinney, Texas resigned from the police force on Tuesday. Eric Casebolt had been placed on administrative leave following the release of the cell phone footage showing him violently confronting a group of teenagers in response to what police say was a call from a resident in the neighborhood reporting a disturbance at the Craig Ranch North Community Pool. “State records show Casebolt, who had been with McKinney PD for 10 years, had 2200 hours of law enforcement classes, including extensive training in both cultural diversity and use of force,” CBS’ Dallas-Fort Worth affiliate reports. For a full rundown of what we know about the McKinney case, the Slatest’s Ben Mathis-Lilley has a recap here.